Effective Monday, April 22, 2019 every morning at 7:30am the Mckinley Executive Center will be towing any vehicles that are parked in their designated spots, at the owner’s expense. This means that if you have parked there overnight you need to move your car absolutely no later than 7:00 to avoid being towed. It will be open on Wednesday, April 17 th from 1-4 for package pickup. Temporary office hours of 10-4 will resume Thursday, April 17th. As always, if there is an emergency, please call the Leasing Office at 734-973-0905 and follow the prompts through to the on-call emergency maintenance line. Good Afternoon Residents of State Street Village! Effective immediately, the Leasing Office will be open Monday through Friday from 10am - 4pm. This is a temporary hours adjustment and we will let you know when normal office hours resume. We apologize for any inconvenience this may cause you. I wish you all a wonderful weekend! "Animal waste is to be picked up immediately by resident, placed in a plastic bag, and deposited into trash receptacle. 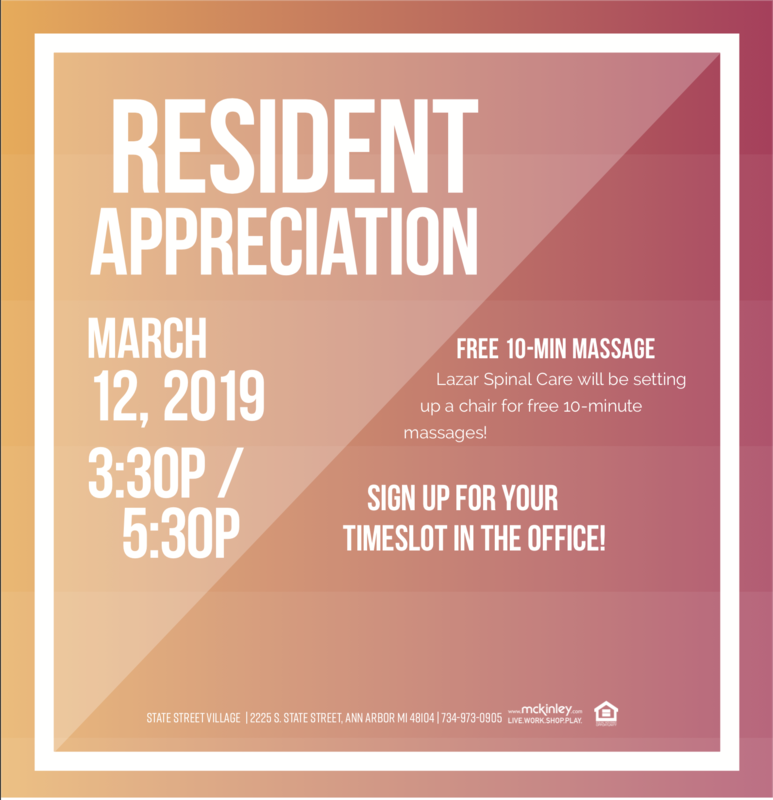 Management reserves the right to fine resident $25 for each violation for removal of waste"
Read more about Resident Appreciation March 12th! I hope everyone has had a wonderful week and stayed safe and warm through those crazy snow and ice days we had! I want to take a moment to remind everyone that State Street Village is strictly a non-smoking community. This includes not only cigarettes but marijuana as well. Even though the State passed the law to legalize recreational use, we continue to enforce our non-smoking policy. While the snow commenced later than anticipated and allowed for an easier than expected commute into work, the same does not hold true for the commute home. Please plan extra time and drive safely! At present, the heaviest snowfall is forecasted to occur between noon and 3 p.m. today, with precipitation continuing into the evening hours although at a much lighter pace. Our snow removal contractor is planning to be on site at 3pm to do a pass through of walks and drive and then again when the snow finally stops. Office Closing at 3 pm Today! We hope everyone had a great weekend and is ready for the snow and cold! Due to the impending snow storm, the office will be closing at 3:00 pm. If you experience a maintenance emergency, please call (734) 973-0905 and follow the prompts to be connected to a member of our emergency maintenance team. Our maintenance team will be here throughout the day and evening and will immediately begin working on salting and plowing the property. Please make sure you are careful as you are walking and driving through the property. Read more about Office Closing at 3 pm Today! The coming days will bring below freezing temperatures, all the way down to -11 degrees on Tuesday night. Brrrr! We will need your help to avoid potentially major issues that can come with cold temperatures.